How do you get the ball entered when the defense denies your entry pass? Whether you run motion, called play, or continuity offenses -- you probably need a way to get the ball to the wing, high post, or slot position. When defenses deny, you need an effective way to get open -- but you don�t want to spend a lot of practice time on it. It needs to be simple, yet effective. One of the simplest ways to get the ball entered on the wing (free throw line extended) is to teach players the fundamental concepts of a �step over� or �reverse pivot� v-cut. This video, from legendary coach Pete Newell, does a nice job explaining how to use footwork to get open. It also explains the circle (counter) move that you don�t hear of too often. Note. Since our motion does not incorporate v-cuts, we only allow players to v-cut on called plays or on the initial entry into our motion. After the ball is entered, they follow their �motion rules�. The concept is simple. 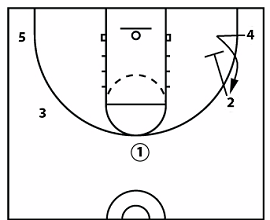 Have your players set up in their transition or half court spots. 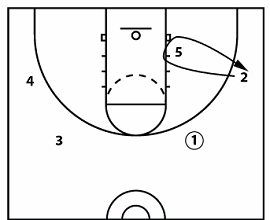 Then have your point guard dribble attack and get into a seam. This should draw the help defender and allow a kick to the wing. It�s really simple but effective. For a more detailed explanation and various options, read this article -- A Stupid Simple Entry that Always Works. To get the ball to the wing, have your point guard dribble there. To keep space and get things moving, your wing can then back-cut, flare, or screen for another player. In this diagram, the wing (2) back cuts and the others fill open spots to the ball. 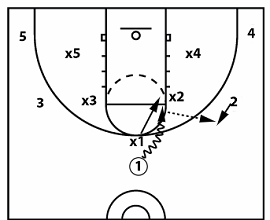 Most motion offenses have rules or guidelines on how to get open. As an example, if players are not open when one-pass-away, we want them getting open by using a face cut, back cut, pop out, or screen away. So once the point guard gets the ball into the �operating area� of the offense, have your players cut or screen immediately when covered. This stays consistent with the base rules of your offense and keeps things simple. 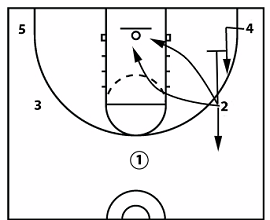 Have your right wing and left corner exchange positions (turns into rub screen). This doesn't work every time but it�s simple and you can call it out when in a pinch. Another similar option. 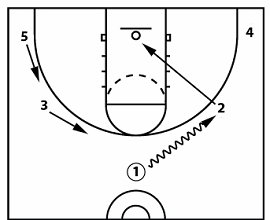 If you have a post player, the wing(s) can rub-cut off the post. The post or the wing should get open. Bigs aren�t used to defending on the perimeter. So bringing your low post player to the high post or slot position can be effective. 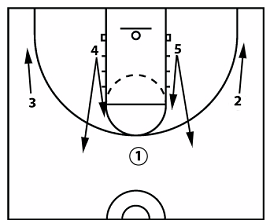 4 and/or 5 can flash to the high post or the slot. In most cases, the post defender will be trailing and you�ll have an easy entry. To get the ball on the wing, you can use alternating actions. To give you an idea, we�ll use a 5 out formation in the diagram to the right. But this can also be done from 4-out or 3-out alignments. The action always starts with the side the point guard is looking at. So in this case the point guard looks to the right. 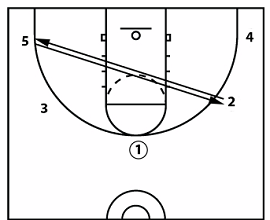 The right wing (2) picks an action (down screen, flare screen, basket cut, or back screen). 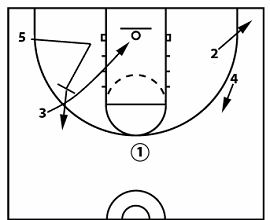 If they get open the point enters the ball. A few seconds after the action begins, the opposite side begins a different action. They can choose flare screen, basket cut, or back screen. In this example, the players decided to run a back screen. The first or second action should get a player open going to the basket or on the wing. The reason you alternate the action is to avoid players getting open at the same time. First look to the right, then when the time is right look to the left. This helps with timing. To save time, pick actions (screens and cuts) that your players already know from their base offense.